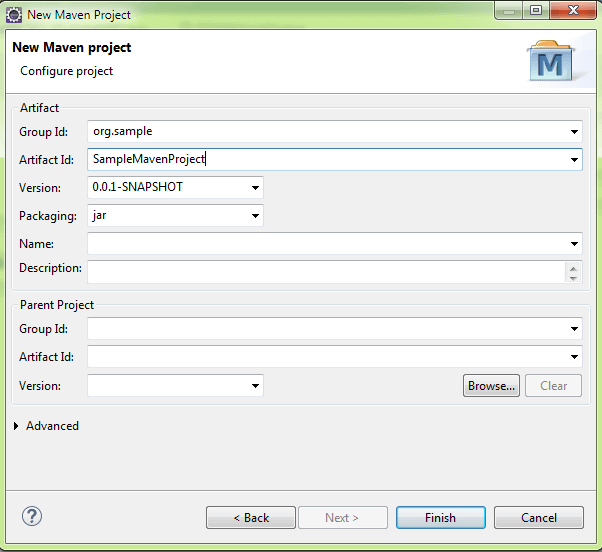 Maven is dependency management tool i.e to execute the frameworks, we need the jar files. Maven helps user to keep the upto date jar file on the framework. 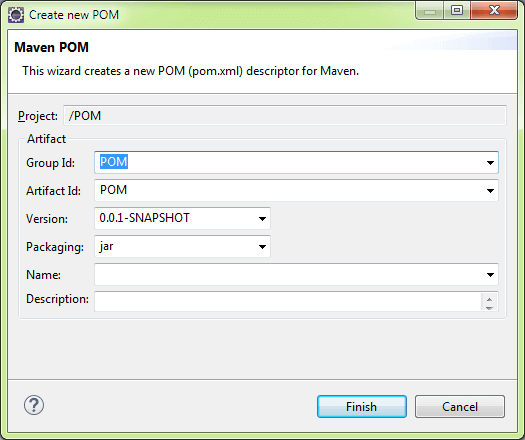 During runtime maven will check the version of the jarfiles present in the local system and compares with pom.xml file. If the latest version is available online then it downlaods them automatically and replaces the local version and then executes the framework. If there is no internet connection or if the latest version is not available, then maven executes the framework with the jar files available in the local system. 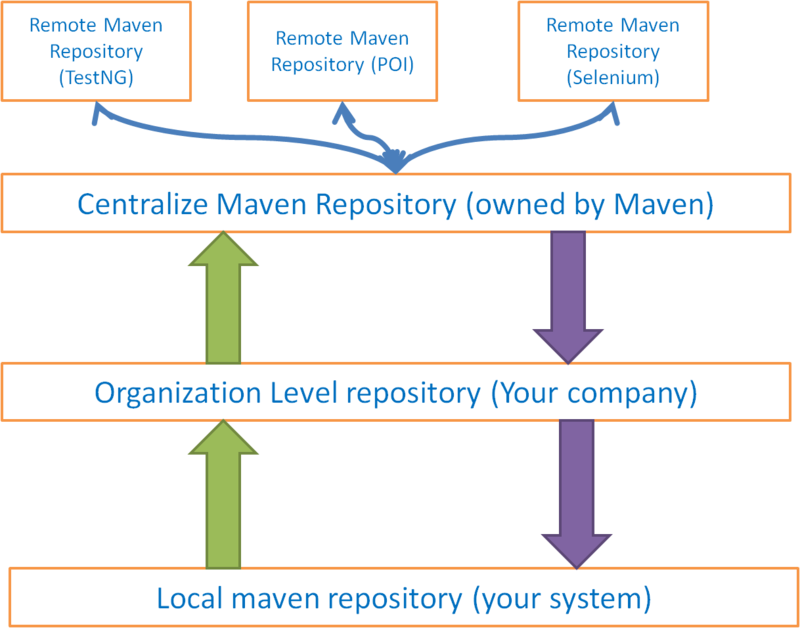 There are three types of maven repository we will discuss about them now on this tutorial. Remote maven repository is manages by the companies who own the software, but they will expose the maven software to the maven. This is a cloud sever owned by Maven, this server downloads all the latests jar files from the remote maven repositories. Organization Level repository : All the required jars are downloaded to this sever from the centralized maven repository. All the big multi-national companies follows this process, First of all we have to request the tool handling teams to review you dependency request, based on our request the tools handling teams reviews and downloads the jar files to organization level server if the jar file doesnot contain any malware. Few organizations follows this and this step is optional, if your organization have this leven then you have use the proxies provided by the tools handling team. Itis the location where the jar files are stored by maven in the locak system, these jars are downloaded from the centralized maven repository. Follow below stpes install maven in eclipse, but if you are using luna or above version you might have maven by default installed with your eclipse, if not follow below steps. 1. 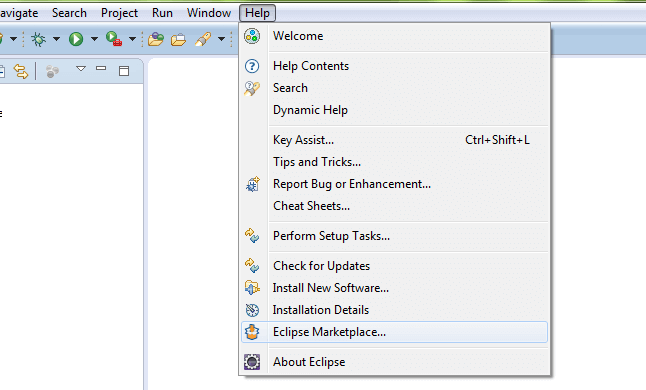 Click on the Help menu, and choose Eclipse Market place. 2. 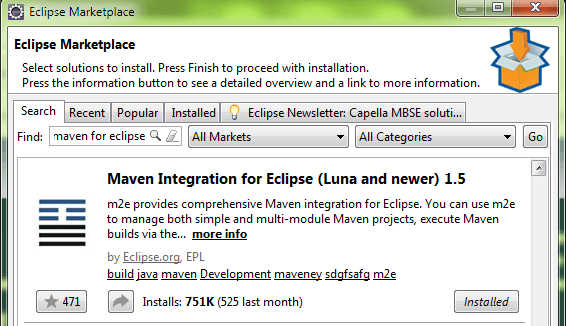 Search for Maven with Eclipse, you will get below software result. As i have installed already, so I will not get install option, for your case you will have to click install option. 3. Accepth the agreement and restart the eclipse, this may take a while. 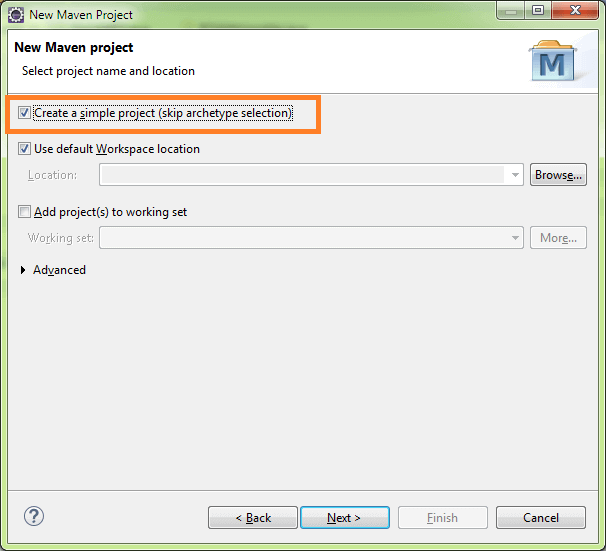 We have to follow below steps to convert the java project into maven project. 5. Fill the details of the project keep version number as 0.0.1 and packaging as jar. 2. 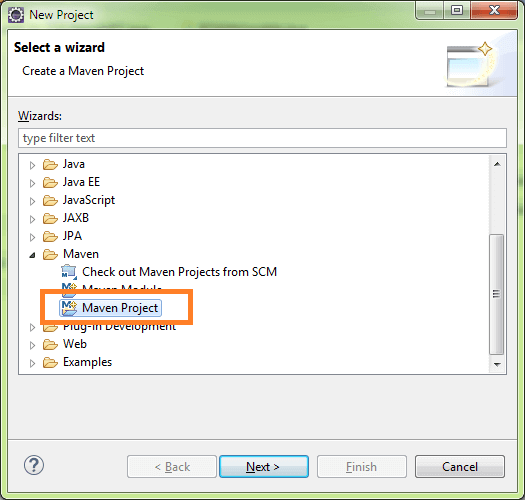 Choose Maven Project from select project wizard and click Next. 3. Check the Create Simple Project Checkbox and click Next button. ArtifactID : is the name of the jar without version. Version : if you distribute the jar(end product) then you can choose any typical version with numbers and dots (1.0, 1.1, 1.0.1, ...). Packaging : how yu want your end product, maven will export the prject as jar or war or any other type we mention. 6. Your sample project will look like below. 7. Open pom.xml, and click on the select the pom.xml tab on the right, You find the source code of the xml file. 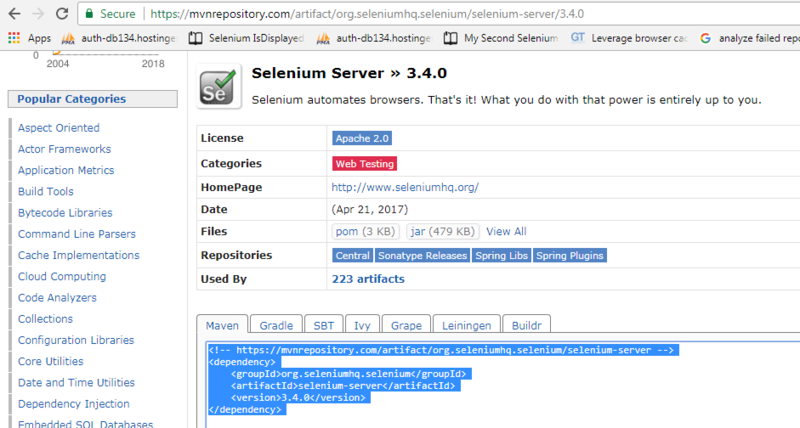 For Example : Navigate to selenium site "https://docs.seleniumhq.org/download/maven.jsp", copy the dependency lines from the selenium site. 9. 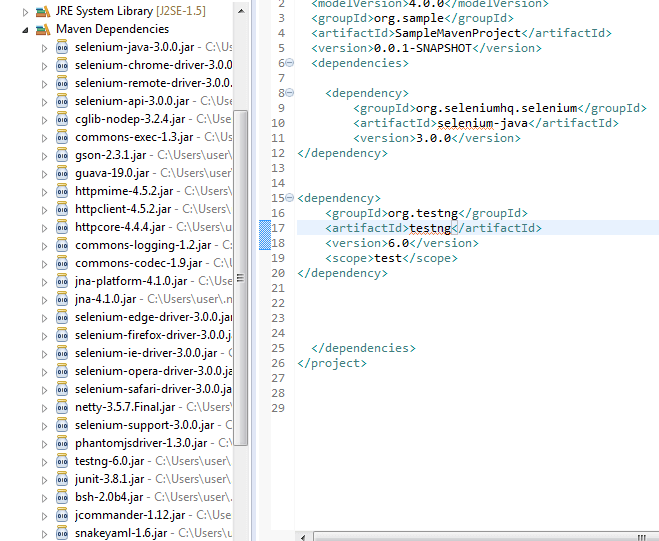 Paste the dependency on the pom.xml, inside the dependecies tag, if dependences tag is not there, add one. 10. Similar way you can add TestNG dependency. 11. 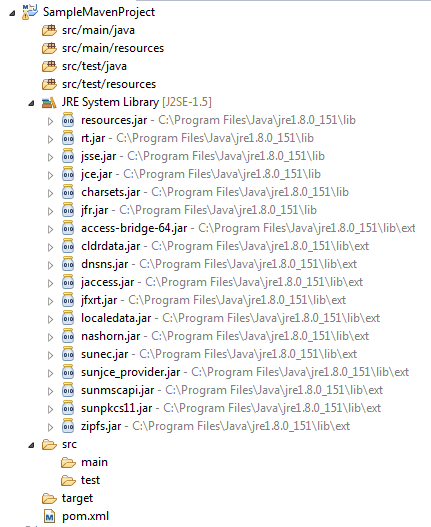 Press Ctrl+S, maven starts to download all the jar files and dependent jar files as well. 12. Optional Steps (only incase of error) : Sometime when we try to download very latest version jars we may face below issue. 13. If above error occurs you may not even able to run the code, to overcome the issue we have to use the stable version of the jar files. 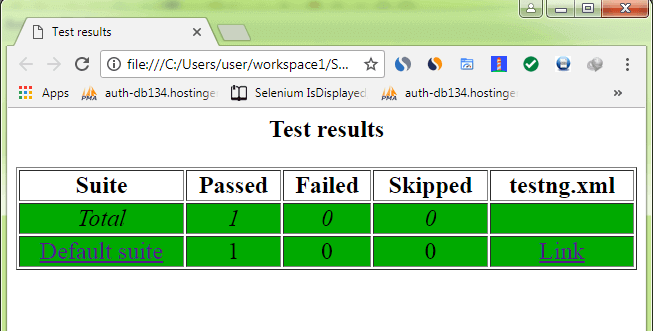 We may not get these details from the respective organizations site (selenium, testbg orgs) but we can get these detials from the maven repository site : https://mvnrepository.com, you can use google for faster navigation. 14. After providing right details on the pom.xml, press Ctrl+S to download all the dependent jar files. 15. Your maven repository should look like below after downloading dependencies. 17. Write following code in that class, if you get no error then we have installed the maven succesfully. 20. 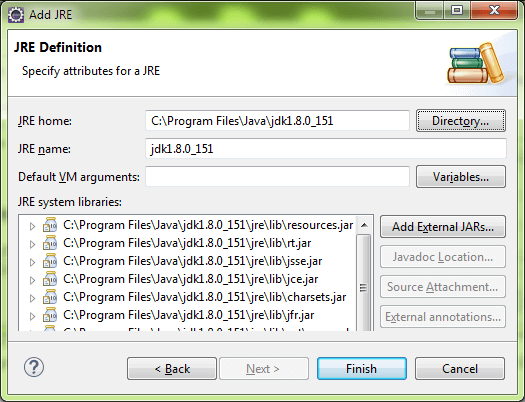 Set the jdk as default jre, and Click OK.
24. Go to the folder's path in explorer, You can find test-output folder, open the index.html file under test-output folder. This Maven lecture is too small. 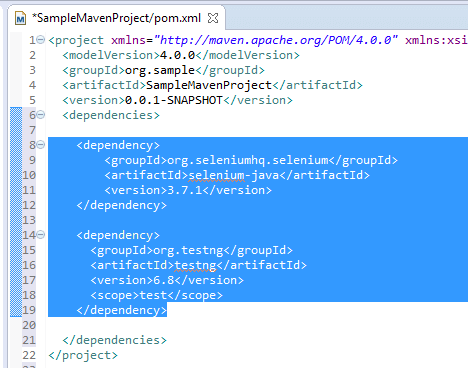 It does not explain for Maven life cycle, it variaous stages and How would U call testng xml in POM xml? I think unlike your other lecture, this one is too basic. We are sorry for inconvenience, we are currently working on protractor  due that we are not able to focus on webdriver part. We would be start working on Webdriver from 19 June 2018, You can see this page updated by 25 June 2018. We would firstly focus on API, Maven, Jenkins.